(Bloomberg) -- In a matter of days, the Middle East has turned the tables on global M&A. 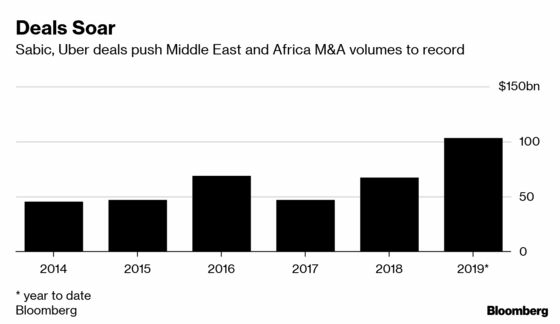 Acquisitions involving targets in the Middle East and Africa are up more than six-fold this year to $103.4 billion, according to data compiled by Bloomberg. That’s inching closer to acquisitions of European companies, which are down 50 percent to $114.7 billion, the data show. Saudi Aramco, the world’s biggest oil producer, on Wednesday agreed to buy a majority stake in chemical giant Saudi Basic Industries Corp. for $69.1 billion, marking the Middle East’s biggest deal. It came just one day after Uber Technologies Inc. agreed to buy Dubai-based rival Careem Networks for $3.1 billion in the region’s largest technology transaction. The Middle East -- not traditionally known for its M&A track record -- is outshining other regions as weak commodity prices force oil-rich Gulf states to take radical steps to stay competitive and spur growth. Banks are leading the consolidation drive. Three of Abu Dhabi’s biggest banks are in the process of merging after the emirate combined two banks to create the Middle East’s second-largest lender in 2017. In Saudi Arabia, HSBC Holdings Plc’s local unit is acquiring Royal Bank of Scotland Group Plc’s local venture, while National Commercial Bank, the kingdom’s biggest lender, started merger talks with Riyad Bank late last year. Combinations are also underway between banks in Kuwait and Oman. Foreign investors are also joining the merger wave. Eni SpA and OMV AG are paying about $5.8 billion for a combined 35 percent stake in Abu Dhabi National Oil Co.’s refining unit, while KKR & Co. and BlackRock Inc. are investing $4 billion in the emirate’s oil pipelines.